Boy did I come across a cool book recently. Let me tell you, it really does pay off to trudge your way through the Previews catalog, because the Really Good Stuff is usually somewhere in the middle or back of that book. 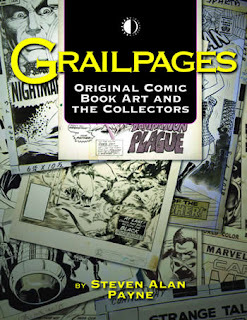 Case in point, Grailpages, a book about original comic art written by Steven Alan Payne and published by TwoMorrows Publishing. The book's full title pretty much gives the one-line high concept of the project--Grailpages: Original Comic Book Art and the Collectors. Yep, that's it in a nutshell. Now, full disclosure here, I am only about 40 pages into this volume, which would normally stop me from writing a review. But this book is SO enjoyable through its first few chapters that I felt I needed to mention it here. Well, that, and I've already skipped ahead and read some of the later chapters and I've already poured over the great art throughout the book. But that's besides the point. Grailpages is filled cover to cover with interviews and commentary on every aspect of original comics art. There are discussions with artists (including the incomparable Gene Colan), writers (such as Roy Thomas and Marv Wolfman), and of course, collectors. And, while I always love to read interviews with comics creators (or authors, filmmakers, etc), the real treat of this book comes in the interviews and discussions with the collectors. From high-earning doctors, to self publishing entrepreneurs, to whatever else these people do for a living, the cast of collectors presented in this volume represents a wide spectrum, and each person has interesting tales to tell. Take the author, Steven Payne. He begins the book with an introduction to tell readers a bit about his own experiences in the comics art world. (Yep, he's a collector!) Payne started out as one of them corporate-types, and after he was released by the higher-ups, he did the only reasonable thing. He bought a few thousand dollars worth of comic art and sold them all to make a tidy profit. Brazen? Absolutely. But, it worked out, and he's been a collector/dealer ever since. From there, Payne jumps right in to the interviews with other collectors, and they each have equally fascinating stories about how they entered the art world--from making friends with legendary pencillers to buying pages on a whim, everyone in the book has a tale to tell. Oh, and the first chapter of the book opens with a quote by art collector Michel Maillot, who sums up the entire hobby in a few words by saying, "Being a collector is a very strange thing, probably some mental illness." Clearly he's joking, but anyone who collects anything knows exactly what he's talking about! Now, one complaint I have comes in the way Payne writes the overarching narrative of Grailpages. Don't think any less of me (and remember that I make my living by editing things to make them sound all smart and stuff) because of what I'm about to say. Payne's book is incredibly (incredibly!) well-written. At times, it is too well-written. What I mean is, he tends to use rather large vocabulary (which is fine in and of itself), but sometimes he does so to the detriment of the narrative flow. Now, believe me, this is a minor nit-pick, but sometimes I think the book tries too hard to say, "Hey, look! Comics art and comics in general, are smart and real and something worthwhile!" when the art that's featured throughout the book proves those points. And I'll get to that in a minute. But, again, I don't want to take anything away from Payne, because what he has created is an incredibly well-written, well-researched, intriguing, and invaluable source on the history and practice of comics art collecting, which in turn becomes a history of the comics art form through a new and unique lens. Now, to put this book over the top in terms of readability and overall quality, the collectors interviewed all provide samples from their (often awe-inspiring) collections. This art, some of which hasn't been reproduced in its original form (sans color) in years--if ever!--makes Grailpages a book that you can return to often. It goes without saying that this is a MUST READ for anyone interested in comics art, and even for those looking for a new take on the history of our beloved medium. Grailpages clocks in at 128 pages, and is offered as a softcover trade. For under $16 bucks, this one is a no-brainer! Thanks for the excellent review of my book! Not just because it's praiseworthy - it's a good review because you took the intent of the book and reviewed it on those merits. Much appreciated. It was great interviewing people like Gene Colan, a personal favorite of mine. And you're right, it's great just to see some of the terrific art! GameCola May Issue Is Here! "Comes a Time, When You're Drifting..."